Discussion in 'PC - Re-Logic' started by Yoraiz0r, Jan 13, 2015. 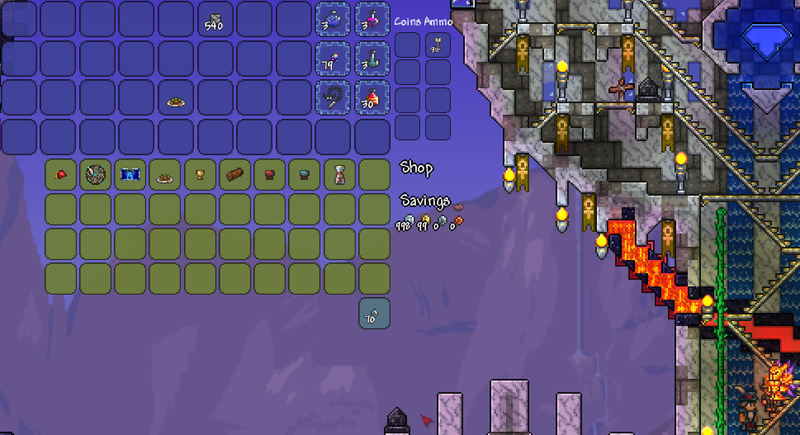 All of us on the Terraria development team hope and trust that each of you had a pleasant a restful holiday season. While we took some time to spend with friends and family as well, we have also been hard at work on the 1.3 update. It is our desire that 1.3 live up to everyone's expectations and leave an epic, lasting impact on the game. It's been a while since we shared some substantial spoilers - so to make up for that gap, you will find a larger-than-usual list of stuff from 1.3 to whet your appetite. Hope you enjoy them! We have upgraded how icons appear/work: things in your inventory will now have their edges lighten up once the cursor is over them. In addition, a lot of buttons such as reforging, opening the crafting grid, PVP, and teams got a visual update -we even added a 5th pink team! We also noted that a lot of in-game text is currently hard to read due to how it blends in with the backgrounds - so we've gone on a bordering spree and are making sure everything has the right amount of clarity and contrast to it is easier to to view and read (even item stack amounts). Moderator Edit: Please note that the pink grass and trees in this image are PAINTED, and not a new biome. On the interactivity end of the spectrum, we have made great strides. In an earlier spoiler Cenx showed everyone you can now link items in chat - but that is merely the beginning of the changes we have made! Items in your inventory can now be "favorited". When you "favorite" an item, you will not be able to accidentally throw, trash sell or stack it into a chest! We even upgraded crafting to take advantage of these improvements - you will be able to craft from an open chest (including the piggy bank and safe)! To further enhance this feature, chests now show as open when they're in use, so you can tell which is which. We have also taken the time to augment how information is displayed to the player by making all the accessories that provide data (time/depth, and so on) work by simply sitting in your inventory. In addition, we added a bunch more of these - such as items which display the weather, moonphase, DPS, and more! The information items you have will also share their effects with any nearby player, but you can easily hide information from your screen when it interrupts you! We have also added a new method for taking screen shots within the game. When you enable our new Screen Capture mode, you will be able to take larger scale pictures of your worlds and builds rather than using the old method of taking many smaller pictures and piecing them together! Further additions include the map marking the last spot where you've died and being able to see text inside signs when you hover your cursor over them from a distance...plus a few other details that I'll leave hidden for now. 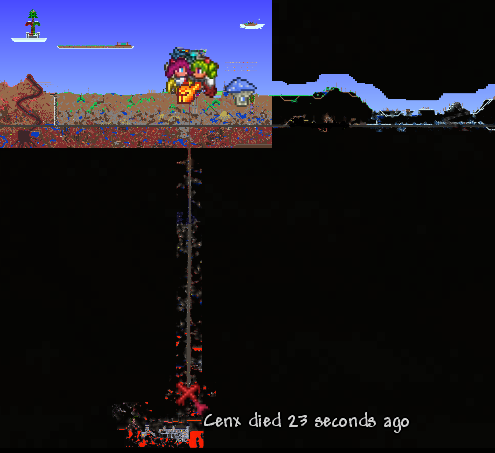 On behalf of the entire Terraria dev team, I hope you enjoy these spoilers and that they continue to keep you hyped and excited for Terraria 1.3! stefnotch, Teal, Duke_Fishron and 302 others like this. Hope this helps to satiate the spoiler-hunger permeating the community of late. Teal, Titanic46618, Ranger Ninja and 33 others like this. Can I Get Uhhh, Ranger Ninja and Theo like this. Holy mother of turtlenecks, this is awesome, my hype is growing exponencially. Can I Get Uhhh, Dg-vr, suu and 1 other person like this. This update will be the best. Titanic46618, PK Supernova Ω, Theo and 2 others like this. Ori, InfinitySnail, Jofairden and 1 other person like this. Those are some amazing features, I hope everything in the new update will be as awesome, and I'm sure it will be! I have to admit, the thing I was most impressed by was that huge structure they built for the demonstration..! Akrasia, Blacklawn, sid3aff3ct and 2 others like this. 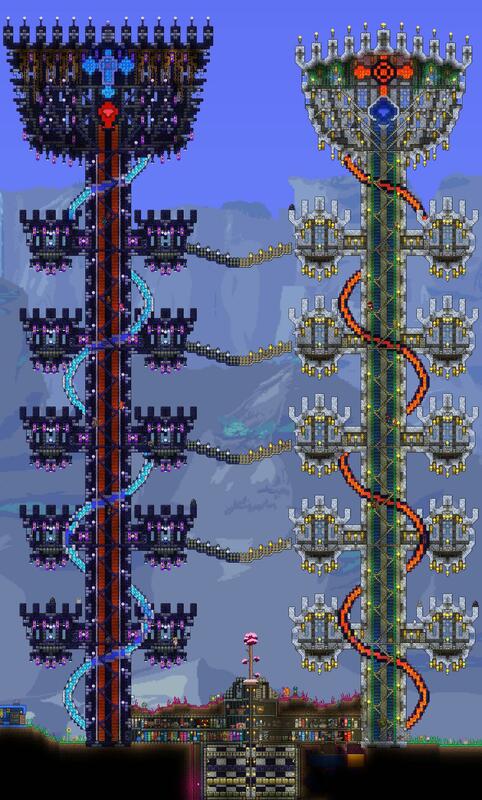 -That tree between those towers... @Snickerbobble confection confirmed? Nah, Like A LOT of other people said, It's probably a snow tree dyed violet, too bad. Snickerbobble and BFlat like this. Love the new interface changes! Nice! I can't wait to actually play this update~!!! 2: The sharpening stone- usually used to refine blade edge's and make them stronger so perhaps a melee buffer kinda like the Crystal ball is a mana buffer. 3: The floating tome table- curious what this has to offer. 4: The Sun Dial- is this just the clock for the Skyware or perhaps is it the night and day turner? 6: Some weird globe like item inside the Traveling merchant's shop. Thought it was a kind of Chakram but am unsure. EditEdit: I see a Lizardforge now too ._. How'd I miss that? EditEditEdit: Huge lever thing as well..
Ediediteditedit: Marble and Granite, nice. Lighter9 and Grand Paladin Tyrux like this. Phoenixruby, Notso and DankySkeleton like this. I LOVE being able to make purchases with NPC's without having to backtrack to my Piggy Bank all the time. Such a huge quality of life improvement for me. Can I Get Uhhh, The legendary, Night and 42 others like this. Hey, the NPCs have lighter outlines now! Can't wait for that one. Pixel and LordDarpinger like this. Oh man, i can't wait. Content updates AND QOL updates? 1.3 is gonna be amazing! Let me just say how impressed I am with everything. All of the new features and changes are really quite amazing! Bas, Von Voogles Worth, Jofairden and 3 others like this. Hashtag-Underscore and Bilgewat3r like this.